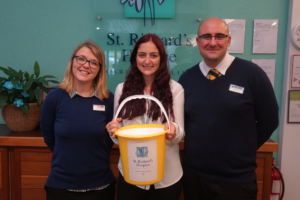 It was lovely to see the guys at St Richard’s Hospice this morning and pass on our donations for the 21 mile Waterways walk. Our grand total reached over £3,300 which is an amazing effort. We would like to thank every one who sponsored us; customers, family, friends, and suppliers; we could not have done it without your generosity! Watch this space for our next Charity event!